Our team consists of young locals who will give you honest and unbiased advice about the city as well as help you discover all the charms of the local transport system. 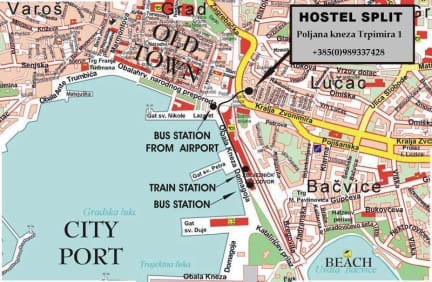 Our hostel is located a couple of minutes walk away from the main promenade, within an inch of the colourful market. Apart from the smile and warm welcome by our staff members, the location is definitely our forte. When you are staying with us everything is within easy reach whether you need a supermarket, drug store, bakery, bank or a bus station. If you, by any chance, during your stay with us feel a sudden urge for an adventure or you want to experience a 'one day escape' to one of our breathtakingly beautiful islands we are here to give you the best recommendations. We do not have common area which is why we are an ideal spot for short stops and quick rest, though we have a fully equipped kitchen. *All rooms are located next to the reception till 01.06.2017. 1. mix dorm (8 beds), located next door to the reception, includes AC, fridge, free of charge internet, Wi-Fi, satellite TV and shared kitchen. 2. Double and twin rooms, some at the reception, other max 5 min walk, include AC, free of charge Wi-Fi, shared bathroom. 3. Double private ensuites, located max 5 min walk, include AC, TV, free of charge Wi-Fi. 4. Apartments (for 2/3/4/5/6/7 persons), located max 5 min walk, include AC, TV, kitchen, free of charge Wi-Fi. Some twins and doubles with shared bathroom don't have kitchen, so you can send us e-mail if you plan to stay a couple of days and need a kitchen. Late check in (from 01.06.-31.08.) after 23:00 (11pm) till 02:00 (2am) latest will be charged extra 20€ in cash. Late check in (from 01.09.-31.05.) : after 21:00 (9pm) till 02:00 (2am) latest will be charged extra 20€ in cash. 48 hour cancellation policy, please send email confirmation of your cancellation. you need to call us one hour before your arrival time. At the end we hope we'll be your choice of stay while visiting Split, and we look forward to it! Once you make your reservation you can be sure that you'll be staying at the best hostel location in town!!! This is an automatic on line booking so one of the rooms will be assigned to you automatically.